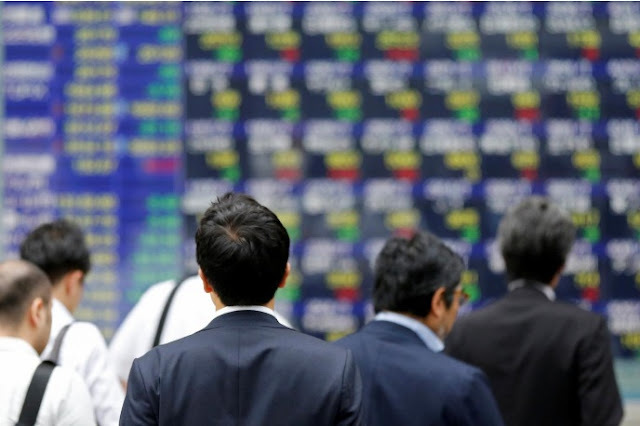 TOKYO - Asian shares rose on Tuesday, shrugging off modest losses on Wall Street, while expectations of another U.S. interest rate increase this year continued to underpin the dollar. Japan’s Nikkei stock index reversed early losses and gained 0.4 percent, as markets reopened after a public holiday on Monday. Korean shares rallied 2 percent on their first day of trading this month, on expectations that tensions with Pyongyang could ease, and as tech shares led by Samsung Electronics Co Ltd caught up with gains made by global stock markets after a long break. Seoul markets were closed last week and on Monday for public holidays. “Global stock markets marked strong gains while Seoul markets were off, and the price of semiconductors continued to rally,” said Lee Seung-woo, a stock analyst at Eugene Investment & Securities. Russian Foreign Minister Sergei Lavrov told U.S. Secretary of State Rex Tillerson in a phone call on Monday that an escalation of tensions on the Korean peninsula is unacceptable. Russia and China both called for restraint on North Korea on Monday after U.S. President Donald Trump warned over the weekend that “only one thing will work” in dealing with Pyongyang, hinting that military action was on his mind. “We are expecting a December Fed rate hike, so we are expecting the trend to be dollar strength and yen depreciation, though whenever North Korean risks rise, that pushes down the dollar,” said Harumi Taguchi, principal economist at IHS Markit in Tokyo. Interest rate futures are now pricing in nearly a 90 percent chance that the U.S. Federal Reserve will rise rates again in December. The dollar was steady on the day against its Japanese counterpart at 112.68 yen. On Friday, it had risen as high as 113.44 yen, its highest level since July 14. “The dollar has re-set to a slightly lower range from last week,” said Mitsuo Imaizumi, Tokyo-based chief foreign-exchange strategist for Daiwa Securities. The perceived safe-haven yen typically rises when investors try to reduce their risk exposure because the currency is often used as a funding source to buy riskier, higher-yielding assets. Japan is also the world’s largest net creditor nation, and at times of uncertainty, traders assume Japanese investors’ repatriation from foreign countries will outweigh foreign investors’ selling of Japanese assets. The dollar index, which tracks the greenback against a basket of six major rivals, edged down 0.2 percent to 93.536, moving away from Friday’s peak of 94.267. That was its loftiest level since July 20, after data showed a stronger-than-forecast increase in U.S. average hourly earnings in September. The euro added 0.3 percent to $1.1773, after it got a lift on Monday from data showing German industrial output notched its biggest monthly increase in more than six years in August. Also helping the euro were comments from a European Central Bank Executive Board member, who called for the central bank to reduce its asset purchases next year. The ECB is due to decide on Oct. 26 whether to continue its bond buying in 2018. Crude oil prices edged slightly higher, underpinned by OPEC comments signaling the possibility of continued action to restore market balance in the long-term. But gains were seen as limited as oil production platforms in the Gulf of Mexico started returning to service after the latest U.S. hurricane forced the shutdown of more than 90 percent of crude output in the area. Brent crude inched up 2 cents to $55.81 a barrel. U.S. crude added 5 cents to $49.63. Gold prices hit their highest in more than a week, though gains were capped as expectations of another Fed rate hike this year supported the dollar. Spot gold added 0.2 percent to $1,286.31 an ounce. Asian shares rose on Tuesday, shrugging off modest losses on Wall Street, while expectations of another U.S. interest rate increase this year continued to underpin the dollar.